The new series specifically designed for the Samsung Galaxy S4 include the Executive Folio Case, Fashion Flip Case, Quilted Folio Case and Fashion Folio Case. The Executive Folio Case is the slimmest premium leather case available for the Galaxy S4—its front cover design boasts a unique cutout that allows users to view onscreen notifications when closed and take photos when fully open. The new series specifically designed for the Samsung Galaxy S4 include the Executive Folio Case, Fashion Flip Case, Quilted Folio Case and Fashion Folio Case. 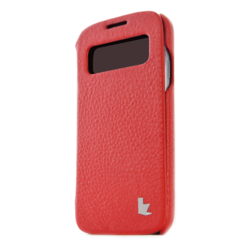 The Executive Folio Case is the slimmest premium leather case available for the Galaxy S4. Jison Case, premier manufacturer of high-end, handcrafted cases for Apple and Android devices, announced the launch of its first product offerings for Samsung’s newest cutting edge smartphone. Each series for the Samsung Galaxy S4 features Jison Case’s signature luxurious styling, while offering superb protection and enhanced functionality in an ultra-sleek silhouette that adds minimal bulk to this ultra slim device. The Quilted Folio Case adds a classic touch to Samsung’s new Smartphone with its luxurious enhanced texture and padding, while the Fashion Folio case offers chic, sophisticated style. The Fashion Flip Signature Flip case also provides timeless elegance coupled with a protective front screen cover to keep the device’s screen shiny and pristine. Each case is available in an array of vibrant colors at JisonCase.com. The Galaxy S4 is changing the game for those seeking a mobile powerhouse that keeps them connected. Now owners of this popular new Smartphone can select from Jison Case’s premium array of protective options that convey their personal style while complementing their busy lifestyles. Handmade by skilled craftsmen, these elegant cases provides Galaxy S4 users with a luxury choice that fuses fashion-forward style with superior protection. Jison Case is a premier manufacturer of high-end, fashionable cases for Apple and Android devices. Each case has been handcrafted from a selection of the finest genuine leather, sourced and imported from regions across the world, including Italy and Australia. Driven by a passion for design and craftsmanship, Jison Case is dedicated to creating premium products that enhance and protect the technology that is essential to our daily lives. Jison Case has offices in Los Angeles, Beijing, Guangzhou, Shenzhen, Hong Kong, and Sydney.